Throughout the past year, the Malaysian Prime Minister Datuk Najib bin Tun Razak kept his electorate in suspense by continually dropping hints that he may call for elections soon. Last year has come and gone without any elections being held. This year, the sands of Time have finally run out for the Prime Minister. 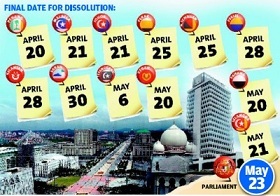 At last, on 3 April 2013, the Prime Minister announced the dissolution of Parliament. If he had not done so, Parliament would have automatically dissolved by 28 April 2013.On 10 April 2013, the Elections Commission announced that 20 April 2013 was the nomination day for aspiring candidates. The 13th General Elections would be finally held on 5 May 2013 which gave a campaign period of 15 days. 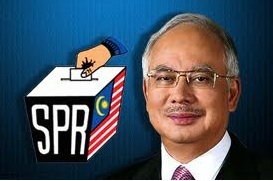 The budget allocated to conduct both the national and state elections simultaneously rose from RM 100 million (Ringgit Malaysia) in 2004 and RM 171.8 million in 2008 to a staggering RM 400 million in 2013. Did the delay in calling for elections have any effect on the potential outcome? If so, could the delay have diminished the chances of winning for the ruling coalition (collectively known as “Barisan Nasional” or “National Front”)? The Opposition coalition faces a far more formidable opponent in the current Prime Minister Datuk Najib compared to his predecessor who was anaemic and inept. The present Prime Minister was far more resourceful and crafty. It could be argued that it was the mistakes made by the previous incompetent Prime Minister and his administration that weakened the initial wave of support for the government. All the Opposition parties (collectively known as “Pakatan Rakyat” or “Peoples Front”) had to do then were to ride the rising tide of resentment. It was simply a matter of carpe diem or seizing the moment in the elections held in 2008. But a good deal of water has flowed under the proverbial bridge since then. The previous Prime Minister spoke grandiloquently about mega projects. His administration seemed serenely oblivious to the plight of the common people. The present Prime Minister has gone to the ground to talk with the common people. His administration has launched assorted projects to ease the burden of ever increasing costs of living for the ordinary folks. In order to assess the chances of winning, let us examine the birth chart of the Prime Minister. Although the hour of birth is not known with certainty, it can be reasonably deduced within an acceptable degree of accuracy. The Prime Minister was born on a 乙Yin Wood in the summer month of 未Goat. The wood element was weak in summer. His wood has roots in the未Goat month and亥Pig day. There was a Three Harmony combination between the 亥Pig day and the未Goat month that resulted in the wood element. Therefore, his wood can be said to be fairly strong due to the structure of the chart. A wood person born in the heat of summer required rainwater. This rainwater was represented by the癸Yin Water. He has this 癸Yin Water in the Heavenly Stem above his巳Snake year of birth. At the same time, the wood also needed sunlight in order to grow. This sunlight was represented by 丙Yang Fire. There was丙Yang Fire in his 巳Snake year of birth. So he has the elements he needed in his year of birth. However, these two elements were located in the year of birth. In terms of timing, the year of birth represented the childhood years. The year of birth could also be deemed as too far away from the day master so the effect would be weaker. Since he was already elderly, the hour of birth was more pertinent. If he were born in the 辛Yin Metal巳Snake hour of birth, then there was the丙Yang Fire in the巳Snake hour which was also nearer to the day master. His 乙Yin Wood day master represented the soft plants such as creepers and vines. These plants required the tall trees in the forest to cling to and climb upwards to reach the sunlight. There is 甲Yang Wood available inside his 亥Pig day. There is also乙Yin Wood inside his 未Goat month. This乙Yin Wood represented his Friends or supporters. However, it could also represent his competitors and rivals. His乙Yin Wood day master depended on the亥Pig day and the未Goat month for the roots of wood. When the巳Snake year arrived in 2013, it clashed with his亥Pig day. If he was born in the巳Snake hour, there would have been another clash with his亥Pig day. This meant that the only roots left for his wood were in the未Goat month of birth. But the未Goat is said to be the tomb or storage of wood. When the wood element is in the tomb stage, it is not considered as strong. But there was 庚Yang Metal inside the巳Snake, not辛Yin Metal. To a乙Yin Wood day master, his authority was represented by 辛Yin Metal, not庚Yang Metal. If he was born in the巳Snake hour, then it was the 辛Yin Metal in the Heavenly Stem above his巳Snake hour that assisted him in his political career. He became Prime Minister in April 2009 which was the year of the 已Yin Earth丑Ox. The丑Ox year had a Three Harmony combination with his巳Snake hour that resulted in the metal element. By then, he was also in his癸Yin Water 丑Ox luck cycle. The result was that there was two 丑Oxen which encountered his 巳Snake year and probable 巳Snake hour. There was癸Yin Water in the Heavenly Stem above his丑Ox luck cycle. This癸Yin Water was the first element that his 乙Yin Wood so badly needed in the summer month. His moment in history had arrived. Although the 丑Ox luck cycle has the 辛Yin Metal that represented his authority, the metal in the丑Ox is considered weak. The丑Ox was considered as the tomb of metal. 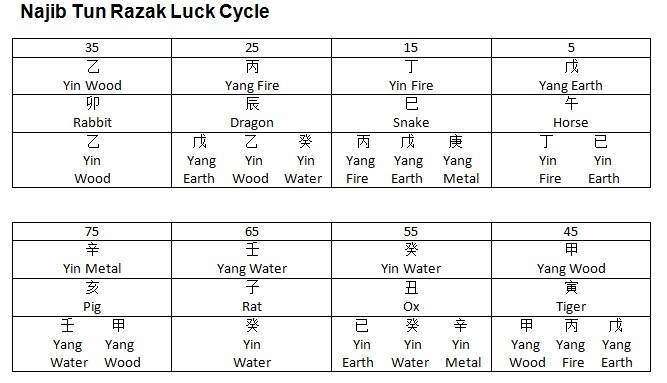 The丑Ox luck cycle was also deemed to be the water luck cycle, not the metal luck cycle. Therefore, his metal or authority star may be rated as weak. The only favourable element that is strong for him is the癸Yin Water. There was already a clash between his 亥Pig day of birth and his 巳Snake year of birth and his probable 巳Snake hour of birth. By postponing the elections to this year, another 巳Snake in the year 2013 was brought into the picture. There were too many巳Snakes to pressure his poor little亥Pig day of birth.